Poseidon, who? Today, you can be a ruler of the seas – with a little help from a Swiss horlogerie, of course. If you’re looking to venture to some of the ocean’s deepest depths, or just want a seriously-waterproof (and handsome) watch, there’s no need to look to the stars for the answers. The nearest (online used) luxury watch dealer will do. But in all seriousness, two of the world’s best dive watches are Omega’s Seamaster Planet Ocean and Rolex’s Sea-Dweller. Although, the similarities pretty much end there. With different movements and functionalities, these watches might as well be oceans apart. So who would win in a fight of Rolex vs Omega? We’ll let you decide. 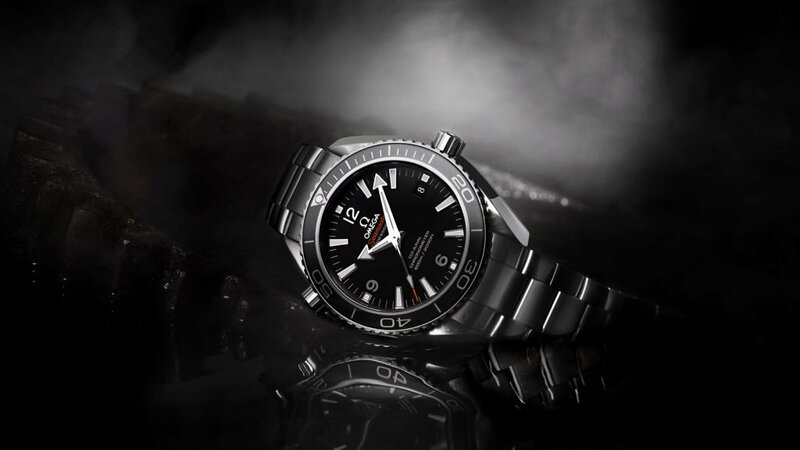 You could say the Omega Seamaster Planet Ocean is the new kid on the block. But the fact that it was released in the early 2000’s hasn’t held it back from making a name for itself in the watch and diving communities. Outfitted with a water resistance up to a whopping 600 meters (2,000 feet), a helium escape valve and world-class 8500 self-winding movement, the Omega Seamaster Planet Ocean is a highly-functional timepiece for those who spend long periods in the depths of the ocean. It’s also just a great looking watch that you’re going to want to wear long after your dive. The large 44mm stainless steel case and bracelet keep it sharp while adding serious wearability for day to day wear. That black, unidirectional ceramic bezel is handsome as ever, and adds to the inherently sporty feel of this timepiece. There’s also the signature orange six, nine and 12 o’clock markers in Arabic numerals that not only help you tell time easily underwater but will catch the eye of any onlooker. Lean in and get a closer look at that black face, too. The date is positioned just where you’d expect it at three o’clock and the luminous markers shine but don’t glare under that scratch-resistant sapphire crystal. 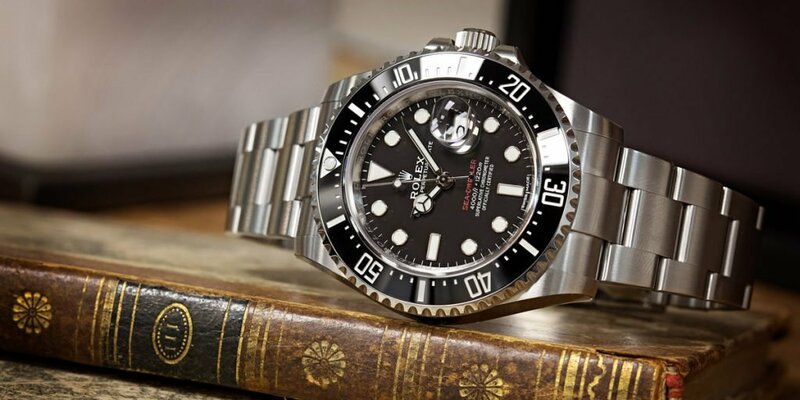 The Rolex Sea Dweller has a longer history than the Seamaster, the first models introduced to the market back in the 1960’s. Since then, the Sea Dweller has undergone various upgrades and changes all in the name of better deep-diving. So for comparison purposes, we’ll compare the newer ref. 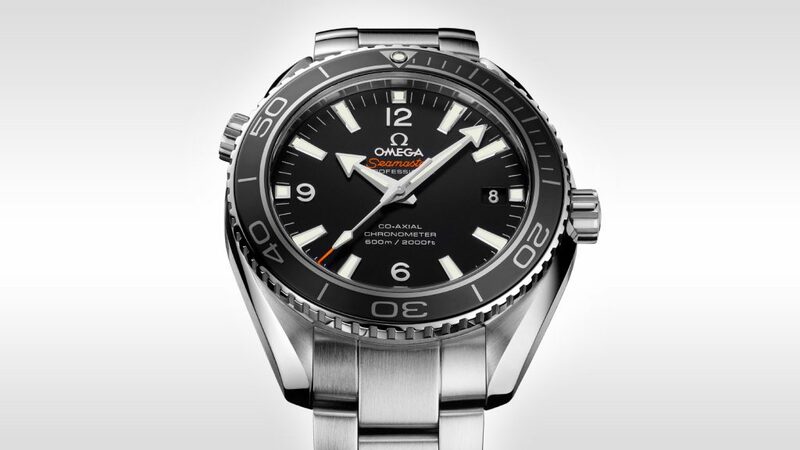 116600 which was produced from 2014-2017 to the Seamaster. Looking at the ref. 116600 with that unidirectional rotatable diver’s bezel, it’s clear that this is a sportsmans’ watch. What’s not apparent at first glance, though, is that behind that stainless steel waterproof case and scratch-resistant sapphire crystal is a modern 3135 automatic movement with that desirable blue parachrom hairspring. But the watch itself pays homage to the early Sea Dwellers, featuring the substantial, but still smaller than the Seamaster, 40mm case. You’ll also notice that while this watch features the date at 3 o’clock, it doesn’t have the signature cyclops lens to magnify it, just like the early models. It’s also outfitted with the helium escape valve which is installed for the most extreme depths — did we mention this watch can go down some 4,000 feet? Amongst the other new features are the long-lasting luminescent hands and hour markers, the state of the art ceramic Cerachrom bezel and 904L stainless steel Oyster bracelet with Glidelock clasp that can be extended to sit outside the dive suit. While the Seamaster has a bigger feel on the wrist, the Sea Dweller has it beat in terms of depth — with the ability to go twice far. In terms of looks, both watches are sporty — the Seamster having a bit more flash with those signature orange markers and the Rolex being uniformly handsome. Where these watches both align, though, is the fact that their stainless steel, waterproof cases make them practically indestructible and ideal watches for everyday wear. While the 44-mm Seamaster might be a bit more in your face than the 40-mm Sea Dweller, they both have handsome, easy to read faces that feature the date (albeit, both without a cyclops lens). In the end, it’s safe to say you’ll love diving with these watches just as much as you will wearing them. 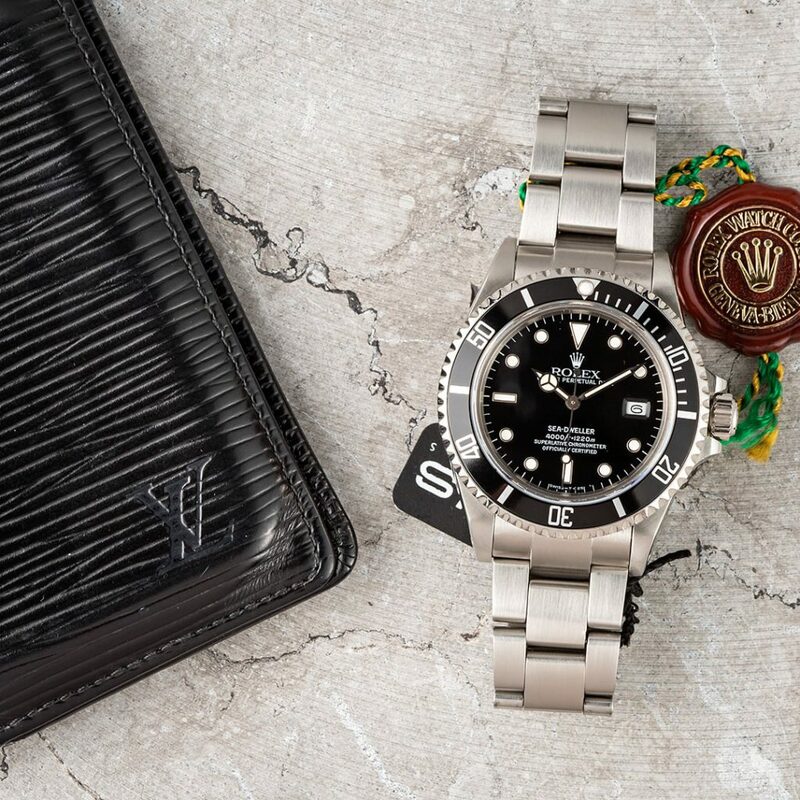 At the end of the day, in a heads up Rolex vs Omega competition, both watches have their admirable traits. We’ll leave it to you to choose.